For the 1949 film adaptation, see Whisky Galore! (1949 film). 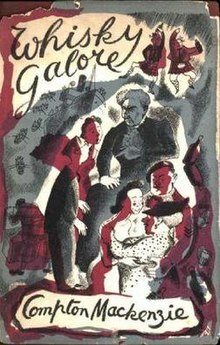 Whisky Galore is a novel written by Compton Mackenzie, published in 1947. It was adapted for the cinema under the title Whisky Galore!. During the Second World War, the cargo vessel S.S. Cabinet Minister is wrecked off a remote fictional Scottish island group — Great Todday and Little Todday — with fifty thousand cases of whisky aboard. Due to wartime rationing, the thirsty islanders had nearly run out of the "water of life" and see this as an unexpected godsend. They manage to salvage several hundred cases before the ship sinks. But it is not all clear sailing. They must thwart the efforts of the authorities to confiscate the liquor, particularly in the shape of misguided, pompous English Home Guard Captain Paul Waggett. A cat-and-mouse battle of wits ensues. Although the wreck and the escapades over the whisky are at the centre of the story, there is also a lot of background detail about life in the Outer Hebrides, including e.g. culture clashes between the Protestant island of Great Todday and the Roman Catholic island of Little Todday. (Mackenzie based the geography of these islands on Barra and Eriskay respectively, but in real life they are both Catholic islands). There are various sub-plots, e.g. two couples who are planning to get married. Mackenzie's prose captures the various accents of the area and also includes much common Gaelic that was in use at the time. The book includes a glossary of both the meaning and approximate pronunciation of the language. The story was based on a real-life incident that occurred in 1941 on the Hebridean island of Eriskay when the SS Politician ran aground with a cargo including 28,000 cases of malt whisky. Official files released by The National Archives show that it was also carrying a sum of cash. In all, there were nearly 290,000 ten-shilling notes, which would be worth the equivalent of several million pounds at today's prices. Not all of this was recovered from the wreck. A theatrical adaptation of the novel, licensed by the Society of Authors (the managers of Compton Mackenzie's literary estate) and written by Paul Godfrey, was first performed as a "bar show" at Perth Theatre in the late 1980s. This adaptation, delivered in the manner of a 1940s radio broadcast, has four BBC Radio Rep actors and a studio manager creating all the locations, characters and sound effects as they would have done in a live radio broadcast. This version was also produced by Mull Theatre in the late 1990s, early 2000s, and 2014, touring to theatres throughout Scotland. A musical version of the novel, entitled 'Whisky Galore - a musical! ', was performed at the Pitlochry Festival Theatre, Scotland in 2009 and 2011. The book was adapted by Shona McKee McNeil and the music was composed by Ian Hammond Brown. A Gaelic language adaption of the novel was adapted for the stage by Iain Finlay MacLeod for a National Theatre of Scotland, Robhanis and A Play, A Pie and A Pint at Òran Mór co-production titled Uisge-Beatha Gu Leòr in 2015. ^ "SS Politician: Whisky galore off Eriskay". The Scotsman. 14 February 2005. ^ Dibdin, Tom (15 April 2015). "Uisge-Beatha Gu Leor/Whisky Galore". the Stage. Retrieved 30 October 2015. This page was last edited on 23 December 2018, at 11:08 (UTC).